Throughout the course of my fellowship at the Cambodian Community Dream Organization, I was able to put my public health skills and knowledge to practice as a Health and Wellbeing Program Officer. It was a great opportunity for me to learn more about project management with the Community Gardens Pilot Program and Women’s Health Program. As a Health and Wellbeing Program Officer, I was directly involved with the Women’s Health Program, Community Gardens Pilot Program, and Breakfast Program at the schools, and supported the WASH and Education Programs as well. The Women’s Health Program addresses a variety of health topics, such as family planning, antenatal care, parenting and child development, and nutrition. There were no baseline data available to assess the current knowledge, attitudes, and practices (KAP) of these topics among women in the rural communities, making it difficult to determine if the Women’s Health workshops conducted in the past made a measurable impact. To remedy this disparity, I developed a baseline survey to measure KAP prior to the relaunch of the Women’s Health Program in 2017, trained data collectors on how to administer the surveys, and supervised them as they conducted the surveys in the field. Once all of the data were collected, I entered, cleaned and analyzed the data, and authored a program report to detail findings. I used the findings from the survey results to develop workshop curricula that addressed the gaps in knowledge among our target population and assisted the community health worker as she facilitated the workshops in the villages. The CCDO has steadily expanded its programming as needs arose. There are data that indicate the malnutrition is still widely prevalent among children in Cambodia. Teachers at our partner schools noticed that children often arrived to school late or missed classes, and when asked, children said that they did not have breakfast at home and would often look for food before going to school. 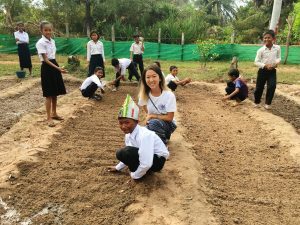 The school breakfast program was created in 2014 to address hunger among students at Kiriminoun and Tapang Schools in Ampil Commune, Siem Reap province. This program feeds approximately 1,000 students at the schools by providing a source of protein, carbohydrates, and vegetables for breakfast to start the children’s day off. The funding to support this program finished in December 2017 and the CCDO sought a sustainable solution to continue the breakfast program and take a less hands-on approach to promote community engagement. Prior to arriving in Cambodia, I drafted a formative research protocol for a hypothetical community gardens program for the CCDO. When I arrived, this program came to fruition, as the program details were hashed out between myself and the Executive Director. I wrote the Terms of Reference for this program to be presented to potential funders and as a guideline for future CCDO staff working on this project. We conducted parent conferences with the community to discuss CCDO’s work in the villages, the school breakfast program, and to introduce the Community Gardens Pilot Program. Through the parent conferences, we recruited interested participants and followed up with them to provide technical support as they started their home gardens. We initiated a Global Giving fundraising campaign to raise money to purchase seeds and gardening tools for our participants as well. The vegetables produced will be sold to the local schools and in the local markets, empowering the rural community, typically women (since they are the main caretakers of the garden and nutritional gatekeepers of the household), to make additional income for their family. I can not stop speaking highly about my experience at the CCDO. I was incredibly fortunate to work with such an amazing team in Siem Reap at such an exciting time for the organization. I definitely plan to return to the CCDO in the future to continue expanding their H&W programming!